AdColony (formerly Opera Mediaworks) | comScore Inc.
Data is from the September 2015 Opera Mediaworks and comScore Inc. report titled "The Impact of Native Mobile Video Advertising on Brand Metrics." An online study was conducted between January 20-June 15, 2015 among US respondents in a control group (n=3,608) and a test group (n=3,584). 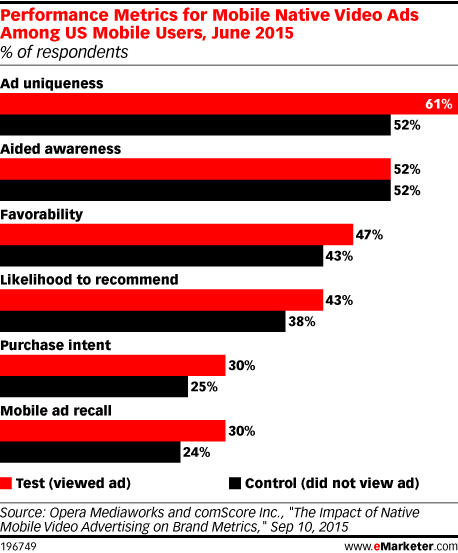 Test group respondents received an invitation to take the survey after having viewed a mobile native video ad from campaigns run by participating brands: adidas, Carl's Jr., Disney (Cinderella), History (Vikings), Lenovo, Machine Zone (Game of War), OnStar, Spike TV (Framework) and the US Navy. Control group respondents were invited to take the survey without having seen the video. The control group was balanced to match the exposed group on age, gender and category usage. Each study was also weighted to have an equal effect on the overall results. The testing was conducted at a 90% confidence level to measure significant lifts over the control group.